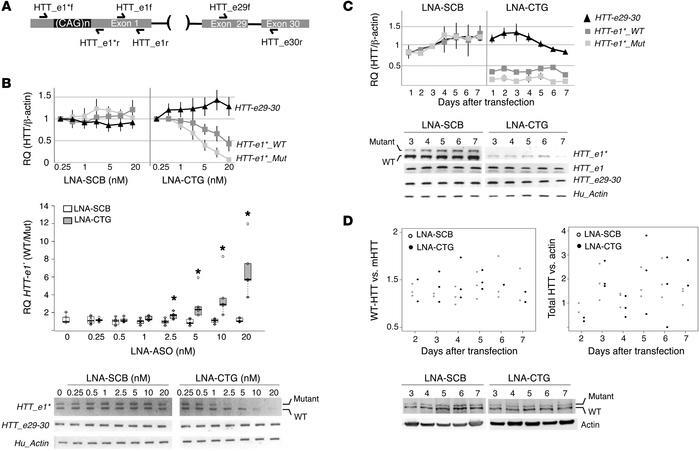 LNA-CTG preferentially binds to expanded HTT mRNA in HD fibroblasts, without inhibiting HTT protein levels. (A) Scheme showing the binding sites of the primers used for PCR amplification in HTT exon 1 (HTT_e1* and HTT_e1 sets of primers) and HTT exons 29-30 (HTT_e29-30 set of primers). The black line represents introns. (B) HTT expression in HD fibroblasts (44_CAG repeats) transfected with different concentrations of LNA-CTG or LNA-SCB, 48 hours after transfection. Graph shows the RQ of HTT using the primer set HTT-e1* detecting WT (HTT-e1*-WT) or mutant (HTT-e1*-Mut) HTT-exon 1 and the primer set HTT_e29-30 detecting HTT-e29-30. Densitometric determinations were normalized to the β-actin PCR product and referred to the mock-transfected condition with a value of 1. Results are expressed as the mean ± SEM (n = 6). Box plot shows quartile values of the RQ of WT versus mutant HTT-e1* mRNA levels normalized to β-actin levels in HD fibroblasts transfected with LNA-CTG or LNA-SCB. A representative gel electrophoresis of the PCR products is shown. *P < 0.05, by Mann-Whitney U test with Bonferroni’s correction for multiple comparisons (n = 6 independent transfections). (C) HTT expression at different time points after transfection with 15 nM LNA-ASOs in HD fibroblasts (68_CAG repeats). The mean determinations ± SEM of HTT-e1*-WT and HTT-e1*-Mut and HTT-e29-30 relative to β-actin PCR products and a representative PCR gel electrophoresis are shown (n = 3). (D) Dot plots show Western blot densitometric analysis of WT HTT (WT-HTT) versus mutant HTT (mHTT) protein levels and total HTT (WT and mutant alleles) protein levels normalized to β-actin and expressed relative to an LNA-SCB–transfected sample with a value of 1. A representative immunoblot is shown (n = 3).